Seeking a brand new way to enjoy summer at it’s best? We’ve found it for you, chill and serve-style. 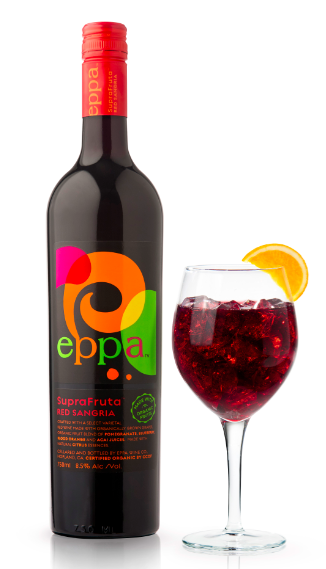 It’s Eppa SuperFruit Red Sangria that’s certified organic, 120 calories per glass and easy to serve. The price is right, too. At about $12 a bottle, it’s a luxury you can’t do without. Starting with great taste and quality, Eppa Sangria was developed to appeal to wine drinkers on a variety of levels. Made from organic and natural ingredients, Eppa Sangria goes a step further catering to consumers looking to maintain a healthy lifestyle and drink something that is truly unique. Eppa is the first sangria on the market that is loaded with real luscious, ripe fruit juice, resulting in almost twice the antioxidants of red wine and fewer than 120 calories for a 5-ounce serving. Sangria generally signals fun and is social by nature. 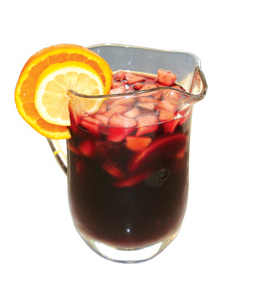 Typically found on chic cocktail and brunch menus, sangria is viewed as a drink enjoyed by those who enjoy life. Having Eppa Sangria on hand makes it possible to indulge in the pleasures of delicious sangria without the added hassle of the numerous fresh ingredients sangria calls for. While most sangria recipes call for a variety of fruit, the fruits used to make Eppa Sangria are actually higher in functional benefits, making Eppa a convenient and delicious way to enhance any gathering – just chill, open and serve. It’s made in the California’s wine country, too. Crafted in northern California at the foothills of Duncan Peak in Mendocino County, the sangria’s varietals include organically grown Mendocino Cabernet and Syrah that are blended with a unique combination of organic juices including pomegranates, blueberries as well as Mediterranean blood oranges, acai berries and natural citrus essences. And, it tastes like something you’d want to serve year ‘round, too.